The stature of his determination and wisdom had overwhelmed me during our very first meeting. As he entered my room, he seated after greeting me vigorously. I saw his eyes dazzling like a conqueror's and lit with an eternal will to explore destinations. His calm face exhibited his immense composure. His persona had unique poise and confidence; all hues of his persona were rather startling. 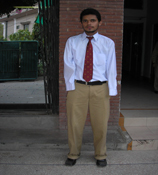 Despite having his both hands amputated in childhood, this exemplar youth excelled to compete with thousands of most brilliants students of Lahore's prestigious Government College University (GCU) and get his extraordinary capabilities recognized. I was pondering over his handicap as well as his performance when he put his appearance in the room and introduced himself robustly. My name is Asad Ali Sultan and I am second year student at GCU, Lahore. I belong to a middleclass family of Hafizabad and need financial help to pursue my studies. Every time this young man called upon me, he left me stranded in a dilemma. While acknowledging and appreciating immense determination demonstrated by a handicapped student elevated me, the failure of hundreds of thousands of physically fit students from matriculation to master's examination every year saddened me too. This dilemma gives rise to a question that as to why a majority of students with all luxuries of life at their disposal fails to perform well in their studies if a poor family's handicapped scion coming from a small district can deliver extraordinary performance and compete with thousands of aspirants in open merit to get admission in a renowned seat of learning. The determination to seek knowledge despite all odds and despite having his hands amputated after receiving an electric shock in tender age left me contemplating that who in fact would have buttressed his sentiments to seek knowledge; how he would have passed his early days of life marred by dejection disappointment and who would have encouraged him at his home and school to pursue his studies strenuously. Asad Ali Sultan was passing his summer vacation at his home in Hafizabad when I reached there to find answers to the abovementioned mindboggling queries. The grandfather of this courageous young man would make empty cases of amulets (talisman) with copper metal to meet their both ends. His father and uncle also joined this low-income business. Asad's family is settled in a two-room accommodation on the third floor of a four-floor four-marla house. Asad's birth being the first of any male child to his parents was fervently celebrated. The proud parents started dreaming of his becoming an officer and a support to the downtrodden family, and with this aim they admitted Asad to a local school. Only a year after his admission, an accident shattered Asad's rest of life and the future breadwinner of the family lost his both hands. Six-year-old Asad along with his parents had gone to a relative's house in a village near Sargodha. High-tension electricity cables were laid at a very low altitude along the roof of that house. With a childish curiosity, Asad tried grasping the wires, causing a huge explosion and the ensuing electricity shock left his hands totally burnt. When Asad gained his senses, he was lying on a bed in a Sargodha hospital with both of hands sporting bandages and the entire family members watching him desolately. This accident was a calamity unleashed on his parents, who would often resort to weeping when the torments Asad was set to undergo in future traumatized them. They were like two living corpses. Asad's treatment continued for many months in Lahore and then Aga Khan Hospital in Karachi that turned his parents overdrawn. However, it did not do any wonder. Finally, Asad's both hands were amputated from wrists and he was discharged from the hospital after his wounds healed up. Now the biggest challenge ahead of Asad's parents was his schooling. Some relatives would urge them to admit their son to a school for special children. But his mother wanted seeing him leading a normal life like any healthy and fit person. She would every time supplicate for a better future of his son. One day, she asked his son to lend his ear and said: Listen Asad, you will have to perform your everyday chores like a healthy and fit person and if you succumbed to your handicap, helplessness will be your destiny. I don't want seeing you relying on any one's dependence. Asad was again sent to the school where teachers and his class-fellows received him warmly. His mother would prepare him for the school and give him an affectionate and benevolent send-off every day. With the passage of time, Asad learnt doing everyday tasks without anyones dependency. Even, he was able to display his sporting skills in Gulli Danda (a local game) and football and cricket as well. Also, he would always top his class. He learnt writing with the help of his forearms and what was more remarkable was that he took every examination without the help of any writing assistant. How you were able to attempt your papers within prescribed time, I asked him inquisitively. In the beginning, I would write at a very slow speed l but I practiced a lot and by the time I was appearing in matriculation examination, I was able to write like any fit person. I asked for a 15-minute concession from the center superintendent of Gujranwala Board to solve my paper more efficiently but he turned down my request. However, despite declination of extra time request, I didn't lose my heart and solved all the papers within prescribed time. Even, I was able to attempt the English paper within first half of the prescribed time. Only Urdu's paper made me realize the shortage of time because I wanted writing more lucidly. However, despite all these hitches, I secured 692 marks out of total 850,Asad gave a befitting answer. About implantation of artificial hands, this zealous young man said: My family had not adequate resources to get artificial hands grafted. However, owing to help extended by a munificent person, I got artificial hands fixed from Peshawar for the first time when I was studying in Class III. But, I could not utilize the same for a longer period of time owing to their weightiness. The use of such a heavy pair of hands caused me severe backache. Moreover, I was not imparted any training to operate these implants. I faced huge inconvenience in writing and performing other tasks, therefore I aborted bringing these metallic assets into play any more. In 2005, Islamabad-based organization, HOPE, facilitated me in contacting Hashmat Affandi, the chairperson of United States-based House of Charity, who took me to Huston where artificial hands were again implanted after a thorough examination of my limbs. However, these implants had quality and capacity similar to the pair I had got grafted from Peshawar. The US doctors advised me to revisit them after nine months and they promised grafting a Bio-Electronic pair of hands during that visit. About these latest implants, I was told that they work like original hands. I was very happy that one day I will be able to find my lost assets that will help me lead a normal life like any fit person but, unluckily, my this dream was destined to doom and I had to withstand more testing times. Hashmat Affandi though brought me back to Pakistan, she never returned my passport to me. In the meantime, I took my elementary level examination and began relishing the hope that I will be able to take my secondary level examination with the help of Bio-Electronic hands. After the passage of eight months, I contacted HOPE's office in Islamabad but received no response. Then I attempted contacting Hashmat Affandi through her cell phone and email but all in vain. Keeping in view my treatment requirements, I was granted a five-year visa but my passport had not been returned to me. Had I been in possession of my passport, I would have gone to America, perhaps with the help of any philanthropist individual or organization to get Bio-Electronic hands grafted. This indeed saddened me a lot. My parents helped me rebuilt my broken resolve and I again started concentrating on my studies and with the grace of God Almighty now I am studying at Pakistan's prestigious institute. About his admission to the GCU and consequent stay in Lahore, Asad said: After taking elementary examination, I was free and I stayed for a couple of days with a relative at Islamia College who showed me GCU's building and told me that this institution enrolls student against highest merit in Punjab. He also told me about some of the alumnus of the GCU. At that time, I resolved to take admission in that institution after my matriculation. Besides determination to enter the GCU, it was because of my exceptional hard work for the next two years that I got admission in open merit category and not the one reserved for handicapped candidates. My family was in seventh heaven after my admission in the GCU but my parents were again faced with an enigma as to wherefrom they would arrange my college fee and other educational expense. However, their main concern was that I had never lived without any one's active support since the amputation of my hands but for the next few years I was supposed to live in a hostel, all alone, without relying on anyone, particularly any of my family members. Somehow, my parents arranged my admission fee and hostel charges and tears flooded the eyes of my mother when I was leaving my house for GCU for the first time. She had constantly and relentlessly supported me throughout my handicapped life. Though I had learnt performing major everyday tasks, still my mother would help me wear socks. My mother's apprehension that nobody was going to help me perform this petty task made her burst into tears. We embraced each other passionately to weep bitterly for next few moments. Finally, she advised me not to take anybody's undue help and favour in the coming phase of my life and prove to the society at large that sheer determination had solely helped me in overcoming my miseries. With a resolve that I would firmly act upon the golden words of my mother, I reached Lahore. Though initially I had to face a great deal of difficulty in doing my routine tasks, however slowly and gradually I was able to solve all my problems. Now I do each of my everyday tasks without relying on anyone. At GCU, I have been provided with every opportunity to seek knowledge and excel in my academics. I also take part in different sports. I can operate computer and internet browsing is my major source of learning. About educational expenses, Asad said: I have been granted a waiver in tuition fee. However, my boarding and lodging expenses range from Rs4,000 to Rs5,000. Though the initial months were very difficult, then a friend of mine informed me about the Karwan-i-Ilm Foundation (KIF), which is now fully financing my studies and I am pursuing my academic pursuits with extreme satisfaction and concentration. As Asad summed up, his elderly grandmother and mother entered the room. Both the ladies expressed their profound gratitude for the KIF management and team members. Especially, Asad's grandmother showered a lot of prayers for the betterment and well-being of every individual at the KIF. Maan jee, we are doing nothing but discharging our duty. We are humbly venturing on repaying the debts of past 60 years. By encouraging the people like Asad, we are securing the future of Pakistan and this is exclusive right of every talented youth of this homeland to be served and protected against ills of poverty and helplessness; the KIF is not extending any favour to them. These were the words I could utter as I prepared to step out of Asad Ali Sultan's house.